Successful root canal treatment can only be achieved by appropriate preparation and impermeable root canal filling. It is important that the clinician must have good knowledge of root canal morphology to achieve a successful root canal treatment. A standardized root canal anatomical classification was suggested by Vertucci, and a clinically more appropriate categorization of the root canal anatomy was recommended by Weine. Sert and Bayirli described 14 new canal variations. However, many variations exist, and it is important to evaluate each individual case for variations. The morphology of mandibular first molar has shown many variations and it is the first permanent tooth to erupt, therefore, it frequently requires an endodontic treatment. The practitioner should be aware of this anatomical complexity that could be present in this tooth type. The aim of this case report was to state the successful nonsurgical endodontic treatment of a left permanent mandibular first molar having two roots that consist of three distal canals and two mesial canals (Type XVIII root canal pattern). 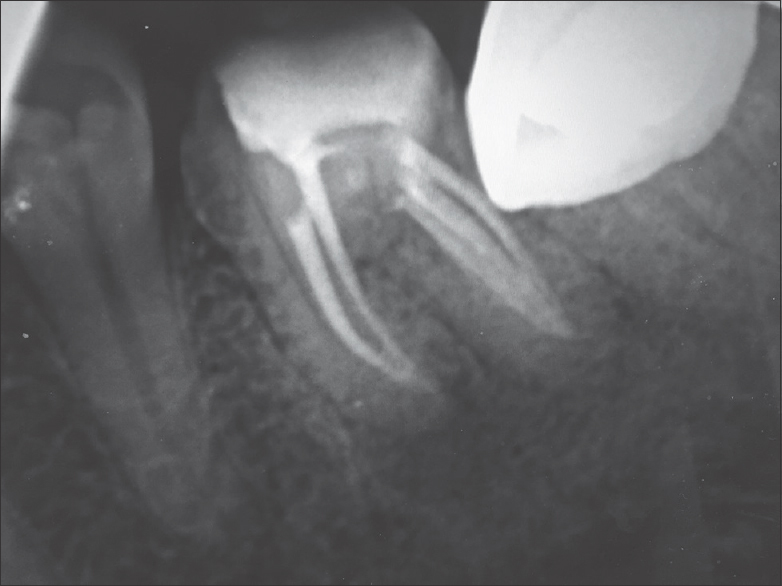 This status resulted as a consequence of the failure of the first endodontic treatment performed, where middle distal canal was undetected and untreated and mesial canals unfilled. A 31-year-old female patient whose major complaint was “severe pain in her left lower back tooth” arrived at our clinic. On first examination, there was a porcelain crown on tooth 36, which had tenderness on percussion. There was no significant finding in the medical history of the patient. The tooth had no mobility and no problems from periodontal aspect. The radiograph taken preoperatively showed a radiolucent periapical area with changes in periodontal ligament space and lamina dura in relation to the apical part of mesial root. From the clinical and radiographic findings, a diagnosis of unsuccessful root canal treatment including insufficient root canal filling and obturation with chronic apical periodontitis was made for tooth 36, and a retreatment was scheduled [Figure 1]. Periapical radiography demonstrated a regular root canal anatomy. After administration of local anesthesia with 2% articaine containing 1:200.000 epinephrine (Fullcaine; Onfarma Ltd, Samsun, Turkey), the porcelain crown was removed and the tooth no. 36 was isolated with rubber-dam. After the isolation, the endodontic access cavity was prepared. A trapezoidal cavity was prepared to provide a straight-line access to all distal and mesial canals. During these procedures we noticed that the middle distal canal could not be detected in old endodontic treatment. The tooth had two mesial (mesiobuccal and mesiolingual) and three distal canals (distobuccal, distolingual, and middle distal) on examination [Figure 2]. Following the detection of the root canals, an electronic apex locator, Dr's Finder NEO (Good Doctors, Incheon, Korea) was used to determine the working length and a radiographical confirmation of these working lengths was taken. ProTaper Next X1 and X2 rotary files (Dentsply Maillefer, Ballaigues, Switzerland) were used for root canal preparation and 5.25% sodium hypochlorite was used for irrigation between each instrument and following this a saline irrigation was performed. Calcium hydroxide with barium sulfate (Meta Biomed Co, Ltd, Chungbuk, Korea) was delivered into the canals, after the canals were dried with paper points and the cavity was closed with temporary filling material (Cavitimi; Imicryl, Konya, Turkey). A second appointment was scheduled after 10 days. At the next appointment, the previous pain on percussion had subsided. The calcium hydroxide was removed with sonic instruments and 5.25% sodium hypochlorite, 17% ethylenediaminetetraacetic acid (EDTA), and 2% chlorhexidine were used for final irrigation procedure, respectively. Paper points were used for drying the canals and they were filled by lateral condensation using Gutta-percha and Dia-ProSeal (DiaDent Group Int., Seoul, Korea) [Figure 3]. After restoration of the tooth with a posterior composite resin core (Arabesk; VOCO, Cuxhaven, Germany) original crown was cemented with polycarboxylated cement. Mandibular first molar teeth often requires endodontic treatment, as they are the first permanent posterior teeth to erupt into oral cavity and due to different variations in the root canal anatomy, they must be treated with caution. Although the tooth generally has two roots, it may have three. The mesial root can consist of two or three canals and the distal can be made up one or two canals. The incidence of four canals in mandibular molar is 35%. The incidence of three canals in the distal root is 0.2–3% [Table 1]. If only one canal is present in distal root it is called the distal canal, and if more than one is present the root may have distobuccal, distolingual, and middle distal canals. Also a developmental groove connects the orifices to these canals. 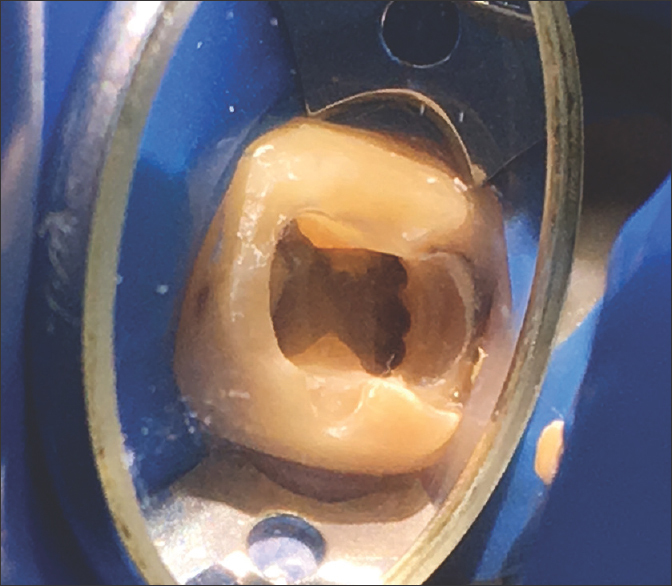 A case report by Baugh and Wallace found that the incidence of a middle mesial canal in mandibular first molar was 1–15%, but a distal root of the mandibular first molar with three canals is a rare case. A study by Kottoor et al. was a single case report about this subject that we can reach during the literature review. Jabali, reported a middle mesial and a middle distal canal in the same tooth using a dental operation microscope. In our case report, the root canal variation of tooth 36 was assumed as a Type XVIII configuration. Sert and Bayirli described the Type XVIII configuration as joining of all three distal canals at the apical third of the distal root. Therefore, in this retreatment case, the inadequate filling of the root canals as well as the fact that the middle distal canal could not be identified in the previous endodontic treatment could be the cause of failure in old root canal treatment. Nowadays, CT scan is likely to be the method of choice in these situations to be certain of the root canal configuration. But for this case, cone beam computed tomography (CBCT) was not necessary therefore clinical and conventional radiographic finding were enough to verify the presence of extra canals. Due to the increased radiation exposure, the benefits of its use must outweigh the risks. 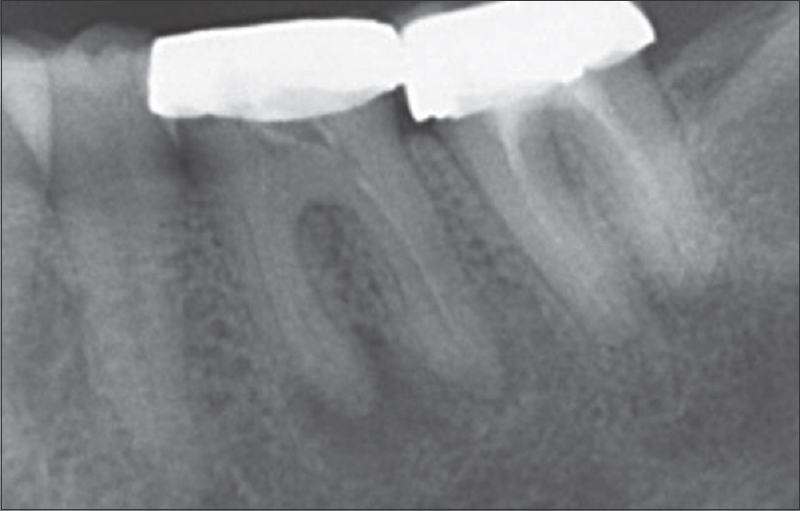 In conclusion, missing a supplementary canal, poor cleaning–shaping–obturation will lead to endodontic failure. Clinicians should possess a thorough knowledge of not only the normal anatomy of the root canal system, but also aberrations. Thus, they should explore the groves in between root canals because sometimes extra root canals may be found. Weine FS. Endodontic Therapy. St. Louis, Missour, USA: Mosby Co.; 2004. Hargreaves KM, Berman LH. Cohen's Pathways of the Pulp. 11th edition: Elsevier Health Sciences; 2015. Ballullaya SV, Vemuri S, Kumar PR. Variable permanent mandibular first molar: Review of literature. J Conserv Dent 2013;16:99-110. Jabali AH. Middle mesial and middle distal canals in mandibular first molar. J Contemp Dent Pract 2018;19:233-6. Durack C, Patel S. Cone beam computed tomography in endodontics. Braz Dent J 2012;23:179-91. Caputo BV, Noro Filho GA, de Andrade Salgado DM, Moura-Netto C, Giovani EM, Costa C, et al. 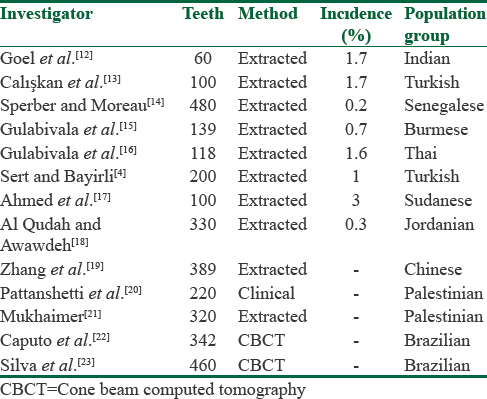 Evaluation of the root canal morphology of molars by using cone-beam computed tomography in a Brazilian population: Part I. J Endod 2016;42:1604-7. Silva EJ, Nejaim Y, Silva AV, Haiter-Neto F, Cohenca N. Evaluation of root canal configuration of mandibular molars in a Brazilian population by using cone-beam computed tomography: An in vivo study. J Endod 2013;39:849-52.